I love devotionals! Though I love reading my Bible, I must admit, I'm not always the best at truly understanding what it all means, or more importantly how it applies to my life. Devotionals can be great for that. It's not just reading your Bible, but actually looking deeper into and reflecting on God's word, and how it applies to my day to day life. And with a daily devotional, it also gives me an easy and convenient way to fit more time with God into my day. But you know what else I REALLY love about devotionals? There are so many options to choose from! There are devotionals written for the athlete. There are devotionals written for the new mom. There are devotionals written for the military. No matter your hobbies or your lifestyle, chances are there is a devotional that is written for you- applying those important lessons from the Bible to those important areas of your life. I've always said that when it comes to my children, I like teaching them new things but coming at them from something that they already enjoy. Learning is much more fun for them when its coming from something they already enjoy. But this isn't just true for children, sometimes even us as adults need that little extra bit of encouragement to learn and grow. That's just what devotionals like this one do. As I was reading some of the devotions, I could not help but think that aside from the lack of photos, I could see some of these devotions being mixed in with some favorite home and garden magazines! It beautifully incorporates the lessons from the Bible into topics like gardening or cooking or diy. It's such a great reminder to glorify God not just in worship on Sunday mornings, but everywhere my life takes me throughout the week. This devotional starts on January 1, making it an ideal gift to begin at the start of the new year, but the great thing is you can really pick up anywhere without feeling as though you've missed something. Each devotion holds their own, so if you start late or happen to miss a day, you can just start back on that day. I love that this is done not just in a 365 day format, but that each devotion has a specific date, as I know personally the devotions I want to read in July are going to be a lot different than those I want to read in December. This format allows the devotions to be relevant to the season we are currently in. Each devotion is just one page, making it easy to fit into our schedule with no problem. Perhaps my favorite part of this devotional are the openings to each month. Some months feature a recipe, some a DIY project and some just a story. This definitely sets this devotional apart from the rest, and is something that every home and garden fan is sure to enjoy and make use of! I will admit that I have not yet finished this devotional, but I am loving what I've read so far and look forward to continuing my reading! If you love home and garden projects and you've been looking for the right devotional for you. this one is sure to be a hit! 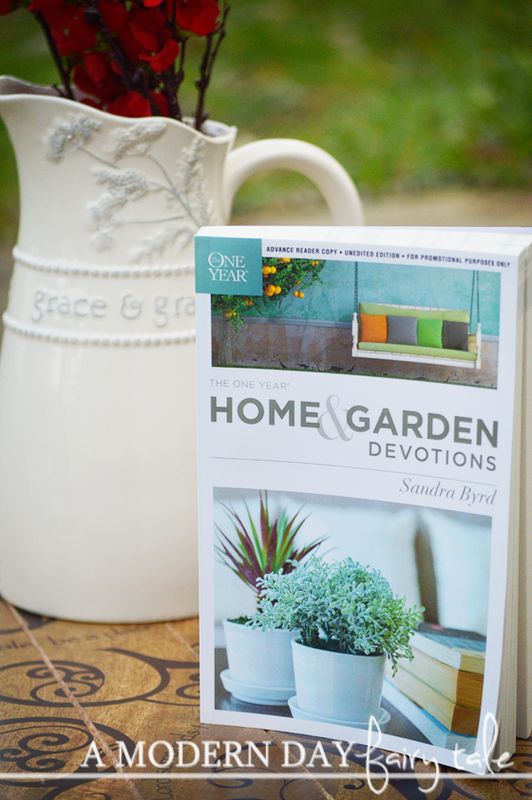 The One Year Home and Garden Devotions is available to purchase now from Family Christian. This sounds nice! I love devotionals, too. So far my fav is one by Spurgeon, but I keep looking for new ones. This sounds amazing!! I know the perfect friend I will gift this to!! And she will love it so much! I love devotionals! I would love to have this. I need a few more devotionals anyway so this would be perfect.